Available weekly to all drop sites except Cougar and Elephant -- available to those sites the 3rd week of every month. 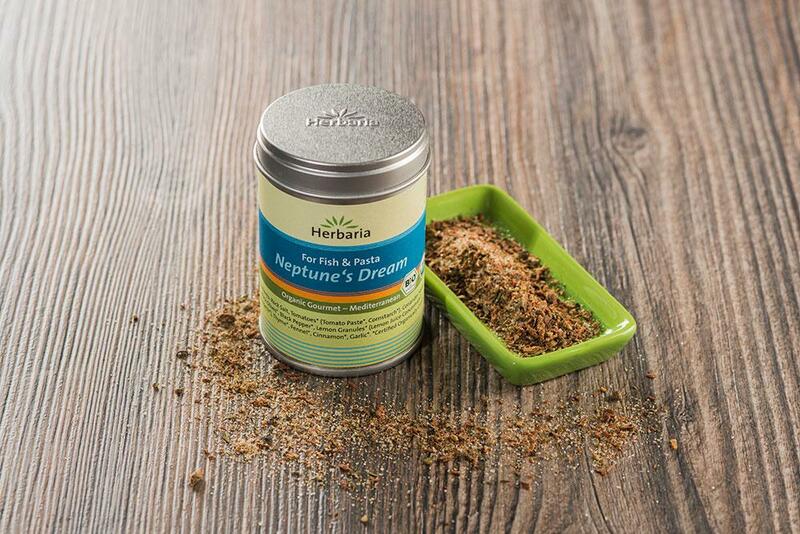 Neptune’s Dream is an organic spice blend for Mediterranean style seafood, fish, vegetables or pasta dishes. Easy to use; simple and delicious cooking. Add Neptune’s Dream to fish, shrimps, lobster, octopus, clams or mussels and marinate for 1 hour. Goes also very well for a vegetarian pasta sauce, in which case Neptune’s Dream should be added while simmering your vegetables or sauce. Also suitable for vegan dishes. Contains 10 carefully selected organic ingredients. USDA Organic and EU BIO certified. The German company Herbaria Kräuterparadies GmbH is one of the few international suppliers of gourmet products in the organic sector to combine high-quality nutrition with high culinary standards, meeting the requirements of customers who search for an Exclusive Organic Gourmet experience. All Herbaria products carry the European Union Organic Seal. This makes proven, transparent, and verifiable quality the hallmark of their ecological products. Herbaria promotes active environmental protection, accepting long-term responsibility for the Earth’s natural environment and climate. They support sustainable forms of cultivation and processing which maintain natural cycles, conserve land, water, and energy resources, and which promote biodiversity. Herbaria works with more than 200 small-scale producers around the world.